The BNC-C-59 BNC compression connectors are the ultimate in termination for security cameras using RG-59 coaxial cables. 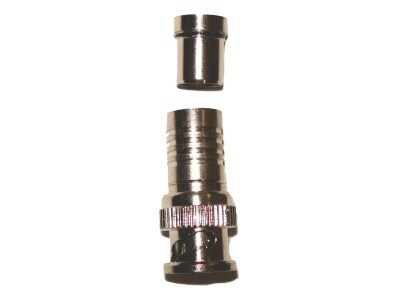 These connectors are a 2-pc style connector, which compresses securely onto the RG-59 coaxial cable. Once the connectors are properly installed, they provide 100 lb test strength. This is the most secure type of BNC connector for making your own security camera cables with coaxial cables. For best termination, use our CT-10 compression tool for compressing onto your cables.